Here is another one of the small restaurants/cafes that are trying to bring the farm to the table. Local Root restaurant does so, but doesn't really do it well (that is for brunch at least). After arriving at a restaurant that looks sort of like a small grocery store, we sat down to find an extremely limited weekend brunch menu which was immediately disappointing. And similar food followed. Incorrect or not descriptive enough explanations of each entree led to food choices that were regrettable. I honestly believe the restaurant needs to change their descriptions for sure and also try harder to walk their customers through the menu. Also, the prices for some of their sandwiches (like the portobello mushroom brioche) were outrageous. $12.99 for a small vegetarian sandwich with soggy frites... I mean come on. I thought they were removing the middle man to give a fresher, cheaper option... instead, it is just an expensive brunch restaurant with average food at best. So my older brother ordered the classic biscuits and gravy breakfast entree. And these were definitely tasty. The meal consisted of two biscuits sliced in half and then covered in a lamb sausage gravy. There is a vegetarian option that features a mushroom style gravy... but when he heard sausage gravy his mind was set. I managed to have a couple of bites. The biscuit was soft and very rich. The gravy was a little on the thinner side and the lamb sausage was not noticeably lamb flavored. Overall, the dish was good, but nothing too different from the other places in the city. I don't know if this is an everyday menu item or just available on weekend brunch. But whatever it is, I probably wouldn't order it unless they added more seasoning to the recipe. Nothing spectacular... well, this is one of the few breakfast platters they offer. It features a vegetable scrambled eggs covered in a sharp wisconsin white cheddar cheese, thick cut peppered bacon, frites, and a toasted ciabatta roll served with butter and homemade strawberry jam. First of all, the restaurant NEEDS to inform its customers that the cheddar cheese is a SHARP CHEDDAR that is DEFINITELY AGED! When it arrives at the table, you can definitely smell it and some people (like my family) doesn't enjoy cheese, yet alone sharp, aged cheese. Luckily, I love sharp cheese so I didn't mind eating the egg scramble but it was just disappointing for everyone else. PLEASE CHANGE THE MENU DESCRIPTION. A great vegetarian option that is different than other restaurants. This sandwich is first of all served on a lightly toasted brioche bun. It is filled generously with two marinated portobello mushrooms, a black bean hummus, and a strawberry jam. It is served with a side of frites which in my opinion were a little too soggy and not well seasoned. The sandwich though was something I would order again. I just wish the put more of the strawberry jam in the sandwich rather than leaving it on the side. So I didn't personally get to try this sandwich, but I figured it is the exact same as the breakfast platter just arranged in a sandwich form rather than having the toasted ciabatta served on the side. For that reason, I don't have much of a description except read the above item and imagine it between two pieces of bread. Once again, nothing here to talk or rave about. - I would come for dinner because they have a much more extensive menu (unfortunately I never have been here for that service so I can't compare it to my experience). - Be careful with the silverware and don't put forks on the plates. The dishes were made in such an awkward way that placing silverware on the plates actually caused them to slide off the edge and onto the table or worst... the floor. It happened several times and was just annoying. Location: 813 W. Fulton Market, Chicago, IL 60607 and multiple other locations! Are doughnuts the new cupcakes? 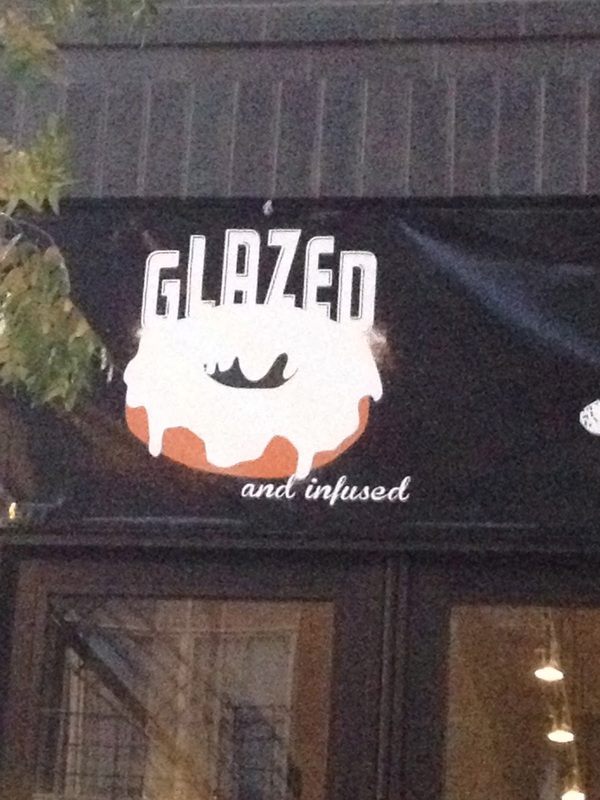 Here is another doughnut shop that has recently opened in Chicago! It appears they focus on more of a contemporary and unique flavor approach but still use the typical doughnut. Besides having the specific set of everyday doughnuts, Glazed and Infused keeps their customers on their toes by offering a special or two every once in a while. Overall, I found the doughnuts to have unreal flavors and amazing combinations. However, the doughnut itself was overshadowed by the crazy combinations. And for that reason, I couldn't rate it as high as the Doughnut Vault. The typical doughnut that many places try to make but don't do very well. Thankfully, Glazed and Infused make an amazing old fashioned cake doughnut. It is extremely dense but super moist. They top it with a vanilla bean glaze which gives a perfect sweetness. I really enjoyed pairing this doughnut with a hot cup of coffee! The only reason I got this doughnut was because the lady behind the counter described it as "death by chocolate" in doughnut form. And wow! The doughnut was cake-like, so more dense than some of the others. It had a chocolate fudge filling and was also topped with chocolate ganache. It is dipped in a chocolate streusel for good measure. The doughnut was one of the most chocolatey food item I have ever eaten and unfortunately it was almost too rich for the morning. It would make a great dinner dessert, but for breakfast I probably wouldn't want such a rich doughnut ever again. 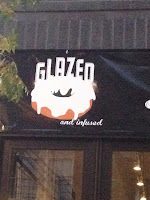 Without question my favorite doughnut at Glazed and Infused. This modern take on a bismarck doughnut is done so well that I would come back again and again for it. The creme filling the doughnut is the same consistency and flavor as creme brûlée! Then to make it even better, they put a layer of sugar on the doughnut and caramelize it with a blow torch. The crunch top on the soft doughnut is the best way to start a day. A MUST TRY! Sounds like an amazing creation, but it falls short. The doughnut itself was a spin on the classic long john. A maple glaze topped the doughnut and a thick cut of peppered bacon was the final topping. The doughnut I thought was too sweet and the maple flavoring was even sweeter. I didn't enjoy the doughnut at all... in fact, I just ate the bacon separately. Another typical doughnut at many bakeries, but surprisingly, everyone love it. After everyone tried the other doughnuts, the apple fritter was left. And in the end, it was one of the first that was finished. It had plenty of softly cooked apples slices, cinnamon, and of course their famous vanilla bean glaze. This doughnut had more substance behind it which makes it another great breakfast option! Absolutely INCREDIBLE! The concept of a PB & J in a doughnut was so simple, but so creative. This bismarck style doughnut was filled with a raspberry jam and topped with a crunchy peanut butter glaze. The peanut butter remains runnier than the store bought kind and the crunch from the peanuts gave the needed textural element. Also, the seeds in the jam contributed to that little crunch that I really enjoyed. I honestly think everyone needs to try this creation! For being the special of the day... This doughnut wasn't anything special. It was a simple glazed doughnut that was dipped in caramel and chopped peanuts. The caramel wasn't put on too thick and it also didnt have too much flavor. The peanuts were peanuts. And overall the doughnut was just another doughnut that I wouldn't eat again. This is another one of the cake doughnuts, but this one is stuffed with a yuzu custard and topped with a lemon glaze and zest. If you don't know, yuzu is an asian style citrus fruit that is packed with flavor. I think of them more as a very sour lime and grapefruit. This doughnut was unreal. They made sure each part had a citrus element, even down to the garnish with candied zest. Overall, it was still sweet because of the lemon glaze, but the citrus filling was an amazing contrasting element! Everyone sees red velvet and everyone has to try it... as did I. This was exactly what the name says... red velvet cake doughnut topped with the classic cream cheese frosting. It tasted more like a dense red velvet cake than a doughnut and the cream cheese was a little too soft for my liking. Overall it was ok... but I would definitely try most of the other flavors before settling for this one again. - Do try the unique flavors... creme brûlée, pb & j, and the luscious lemon. These all were not the average doughnut and something different to try. - Share doughnuts!!! You can try a little bit of everything! - Don't get here too early. The line is not as crazy as the Doughnut Vault and it seems as if they have plenty of doughnuts throughout the day. - Driving to the area is tough... parking is minimal in the Meat Packing District of Fulton St. Finally! Lotus Cafe is one of the first Vietnamese restaurant to open near UIC or better yet, the south side of Chicago! I have been waiting forever for a place to serve banh mis and THEY DO IT WELL! The concept of Lotus Cafe is great... if you are hungry you can order one of the larger banh mi sandwiches, but if you are just looking for a small quick snack, they offer the recently-made-popular bao! Each of the options pack a lot of flavor, especially with the pickled vegetable toppings, and best of all, for a good price! It is hard to choose just one so enjoy mixing and matching and hope this blog entry helps you make the right decision! By the way, the ladies that run the shop are extremely nice! This egg roll is stuffed with chopped pork belly, minced shrimp, taro, sweet potato, vermicelli, and mushrooms. It is then deep fried and served with a chili sweet and sour sauce. Overall, the egg roll wasn't as crispy as I hoped and there was an overwhelming shrimp flavor. I did like the textural difference created by the other ingredients inside. I will say I had my order "to-go" so I can understand why the crispiness may have been lost. I will definitely try it again at the restaurant or one of their other egg roll options. This is another one of the "appetizers" that they offer. Unfortunately, this was isn't as great as I was hoping. Each of the rolls is stuffed with a couple of shrimps, romaine lettuce, vermicelli, and some cilantro. The overall flavor is fresh and plain. The sauce is a life saver because without this soy sauce-based sauce with spices, the dish would not be tasty. I would skip out on this option if I were you. I love banh mi sandwiches, so I have definitely had my fair share throughout the city of Chicago. I was happy to finally find a restaurant that serves a legit banh mi that wasn't located in the neighborhood of Argyle or in a market that is difficult to park. Anyway, the sandwich had steamed pork belly, pate, headcheese, and pork roll. It was topped like all their sandwiches with pickled daikon and carrots, cucumber, cilantro and a thick slice of jalapeño. The bread was extremely soft except for the thin crispy crust which I thought was an amazing vessel for the banh mi. The juices of the meats and pickled vegetables dripped out the end every bite I took. For just under $6, the size was huge... I was pleasantly surprised and I know I will come back to try they other options. This is one of their bao options that is the alternative to the banh mi. The smaller rice flour bun (for less than $2) is filled with the same ingredients that would be in the traditional vietnamese sandwich. This one in particular was filled with sliced pork shoulder cooked in a honey and lemongrass glaze. It was served with they typical pickled daikon and carrots, cilantro, cucumber, and of course the jalapeño pepper for some spice. I thought the pork was a little sweet, so I added some sriracha sauce which gave it a nice kick. The bread was fantastic! It was soft and fluffy and also soaked up the natural juices really well. I can't wait to try this one banh mi style. I had to try the beef bao mainly because it had a sunny-side up egg inside of it. Unfortunately, this bao singlehandedly made me drop the rating of the restaurant because the meat was horribly tough. I honestly couldn't bite a chunk of the meat off and had to chew vigorously for several minutes. The flavors were there, but I couldn't look past how tough the beef was. Also, the sunny-side up egg was actually cooked "over hard" so no yolk was running down the side... I was definitely disappointed. I wouldn't suggest this sandwich to anyone until its changed, so I hope they find a better way to make the meat tender. After the disappointing sunny-side beef option, I was happy to try another great bao or banh mi filler. The chicken option is a steamed and shredded chicken cooked with a soy-ginger sauce and served in my case on the rice flour bun with the typical pickled vegetables and jalapeño. You could definitely taste the ginger, which I really enjoyed, and this time the jalapeño added just enough heat to make the bao very enjoyable. If you are a little hesitant to try pork belly or some of the other more creative option, this is definitely the choice for you! It is delicious! - Do order a couple of the Baos if you intend for them to be a meal. They are good sizes for the price but to be full you will probably need a couple. - I liked to add the sweet and spicy sauce to my sandwiches. - Do spread the word! It's a newer restaurant in by UIC and one I hope to be around for a while! - Personally, I would stay away from the beef unless tough meat is something you enjoy. I think the Soupbox is one of the better small time restaurants in Chicago offering a quick, affordable, and healthy lunch. For well under $10, you can get a nice cup of soup and bread that is much better than Panera Bread and also much tastier. Sometimes I wish they offered more of a variety, but I can understand why they only want to rotate a few of the options. I did find some of the soups to be a little too creamy, but overall, all the options are somewhat unique and definitely flavorful. This is definitely one of my favorite soups from Soupbox. It is a cream based soup packed heavy with wild rice, roasted chicken, diced carrots, onions, and a touch of thyme. You can tell that the soup has been cooking for a while because of the soft veggies. I love this soup because of the richness. Dip the multigrain bread or sourdough bread into the soup and enjoy! I always enjoy a nice bowl of chili and Soupbox makes an excellent one with different ingredients than you may be used to. First of all, they use a roasted chicken as the protein rather than the typical ground beef. They slow cook everything, including red beans, poblano peppers, onion, and the typical chili spices. I found the chili to not be very spicy (which was unfortunate) and a little watery compared to what I am used to. It was still a great soup and I will definitely try it again in the winter. One of their most popular, if not the most popular, soup at Soupbox. I like it much better than Panera Bread, but it is a little different. This version of broccoli cheddar soup has white cheddar cheese and a cream base to it. They add both broccoli and carrots and then cook it down until a mushy consistency. I thought it had more of a fresh flavor (the broccoli actually shines) which was pleasant. Serving the soup in a bread bowl is another option... it costs a little bit more but the bread bowl is a nice touch. My friend chose a couple of cookies from the Soupbox. You can tell that baking isn't really their strong point, but these cookies definitely satisfied a sweet tooth. I really enjoyed the melted chocolate chip consistency. - Do ask for samples. They let you try a little taste of any of the soups, so before you make your decision, make sure you like it! 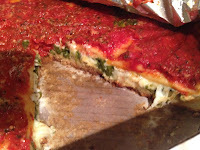 - Look at Groupon for a deal to Soupbox. I think everytime I go I always have a Groupon to the restaurant. - I wouldn't get the bread bowl. You can ask for unlimited chunks of bread so there is no point in paying extra for the bread bowl.